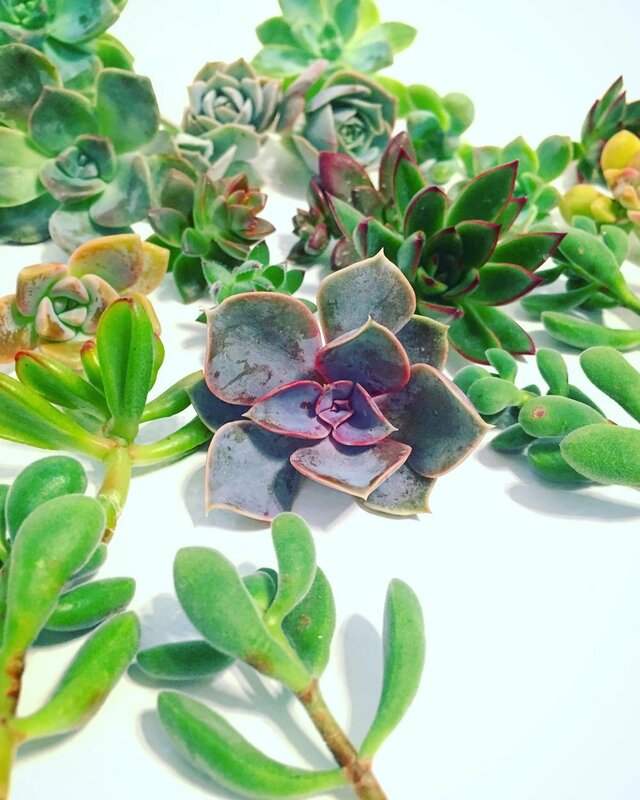 How to grow your succulent collection through taking clippings, as well as, through growing your own baby succulents from leaves. Remove some leaves from the stem, right above and right below where you are planning to clip/cut. Clip with clean blades (shears or scissors work great). Remove a few leaves off the bottom of the clipped portion, to create more of a stem, and from the top of the remaining planted stem to spur on new growth. Using clean shears, clip at the base of the rosettes. Gently lift up the mother plants' lower leaves (referred to as the “skirt”), revealing more of the young plants (called “pups”) underneath. With your clean blade, cut just underneath the pup, where the stem connects to the mother plant. Allow clippings to sit for about 24 hours, rinse them all with cool water and gentle, eco-friendly soap. If short on time, simply mist all the clippings with a solution of 70% rubbing alcohol diluted with water. Allow the clippings to dry completely in an area with bright and indirect sunlight (indoors or out). Remove any extra leaves and cut back stem as needed (leave a longer stem if you want to plant it, or almost no stem if you will be using for glued on art). You are now ready to plant or create art, with your succulent clippings. Sidenote: New plants will often regrow from where you clipped your succulents, so continue to water and care for the remaining stem to spur on even more succulent growth! · Remove leaves from stem by gently twisting and pulling to avoid damaging the bottom section of leaf (where it attaches to the stem). · Lay your leaves on top of succulent soil, or pumice, in an area with bright, yet indirect, sunlight (outdoor, shaded area is ideal). · Be patient. Do nothing until you start to see either tiny roots, or a very tiny plant, begin to emerge from the bottom of the leaf. · Once roots, or baby plants, are visible, mist every 3-5 days. · Wait, wait and wait some more, while continuing to mist about 1-2 times per week. After the “mama” leaf becomes wilted and decayed, gently separate the baby plant from the leaf (this usually takes about 6 months but can vary). · Delicately plant your baby plant and continue to water about 1x per week. you are now a proud succulent parent!